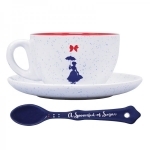 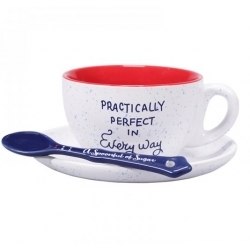 This Disney Mary Poppins cup, saucer and spoon set is a practically perfect way to enjoy a hot drink. With a beautiful white and blue speckle glaze, the mug has a contrasting red inside glaze, and features the quote "Practically Perfect in Every Way" on the front and a silhouette of Mary Poppins on the back. 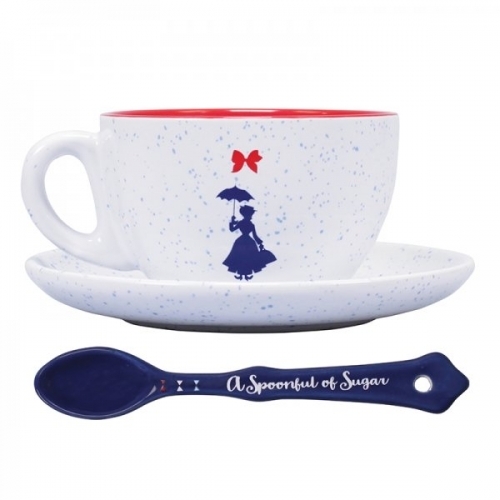 The blue ceramic spoon features the famous quote "A Spoonful of Sugar".